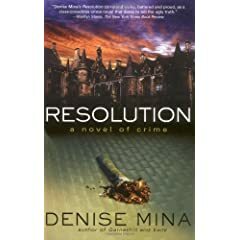 Resolution is the final installment of the Garnethill trilogy. As both Maureen and Leslie were left jobless at the end of Exile, the story opens with them selling illegally imported cigarettes at a flea market. Maureen's father is still in town, the rest of the family (minus the ever-supportive Liam) refuse to acknowledge the sexual abuse that they know occurred, and Maureen is terrified that her sister's unborn child will be a little girl. To prevent history from repeating itself, she's seriously considering patricide. You'd think that would be enough torment for anyone, but she's also slated to appear in court -- as the star witness -- to testify against the person who killed her ex-lover in the first book. She knows that if he is released, he'll come for her. And her drinking is starting to catch up with her. So, when another flea market stall owner tells Maureen that she's taking her son to small claims court and then ends up badly beaten in the hospital, Maureen sees the situation as a way of keeping her mind off of her own problems. I'm sure I said this about the other two books, but WOW. Denise Mina is fab. Her books are gritty and grimy and gloomy but sometimes funny and just plain wonderful. The characters are well-drawn, many of them quite unlikeable yet still understandable -- As a friend of mine said, "You know you're in trouble when the most decent person in your family is a huge drug dealer" -- and honestly, now that I've finished the trilogy, I think I'll miss them. Not just Maureen and Leslie and Liam, but her horrible mother and sisters, too. I'm going to read the hell out of Denise Mina's other books. Soon.